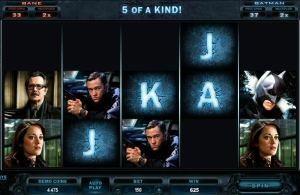 The Dark Knight Rises is another instalment to the Batman themed games on offer from Microgaming and it follows a similar recipe to the other hit games from this developer. 5 reels with 243 paylines mean there are more winning combinations then you will probably ever manage to exhaust. This isn’t a progressive jackpot game like its predecessor which just means that the carrot is smaller but there are a lot more of them and they are a lot closer, which is a win. Playing begins with as little as 30 pence a spin and the stakes can go as high as 15 pound per spin, meaning nearly all gamers will find a risk and reward level that suits them. As mentioned earlier, there is no progressive jackpot in this game but this has been offset by a few new features including a Free Spins accumulator, Symbol Scramble and Split Wilds. These features really do make a difference and make up for the lack of massive jackpot with much more frequent winning. You cannot activate these features yourself, I haven’t managed to yet anyway, but they are instead activated randomly to bring you joy and happiness and if all goes well winnings. The Symbol scramble feature moves all of the symbols around on the reels, potentially giving you a winning combo. There is a fight mode feature that when triggered causes Batman and bane to fight it out to determine how many free spins and what multiplier should be added, ready for the next time you activate the Free Spins bonus feature. You can activate the Free Spins bonus feature much like any other game from Microgaming, by getting three or more scatter symbols anywhere on the reels. Once this happens you will be awarded 10 free spins, as well as the ones you have accumulated elsewhere. Not only that but you then also enter into one of two possible bonus games playing as either Batman or Bane. The features of the bonus games vary depending on whether you are Bane or Batman, both have their benefits and issues but that will be down to personal choice. Like a simple game? Go for Bane. The Dark Knight Rises I available for mobile and works well for both iOS and Android. If you play it on Android, remember to switch off the sleep screen function as it may kill the download. Otherwise, it runs smoothly on both tablets and smartphones. This slot should be available at any casino that has a Microgaming platform. Some examples include Vera & John and VideoSlots. To say this game is packed with features would be an understatement. From the fight mode to the plethora of different kinds of Wilds on offer, this game will keep even the most hardened Slot Gamer occupied for hours exploring the various different modes available playing as the two characters. The Dark Knight Rises is a medium variance game meaning the stakes and winnings are medium sized and the winnings come pretty regularly. Perfect for the more impatient gamers out there but maybe not the ideal game for the big money players. All in all, a solid addition to the Batman gaming franchise and Microgaming’s portfolio.